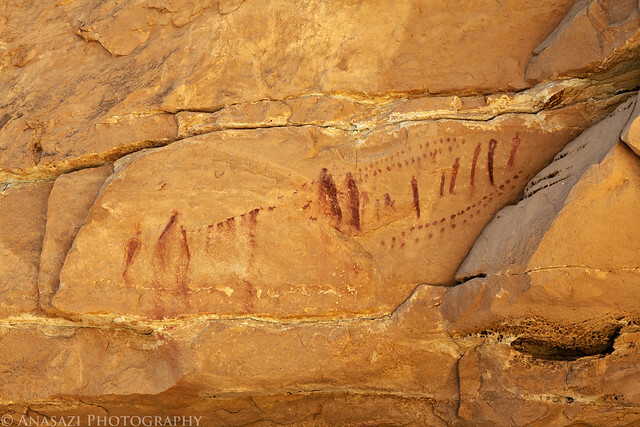 After spending Black Friday in Nine Mile Canyon I spent Saturday searching for and visiting some new rock art sites in the San Rafael Swell. 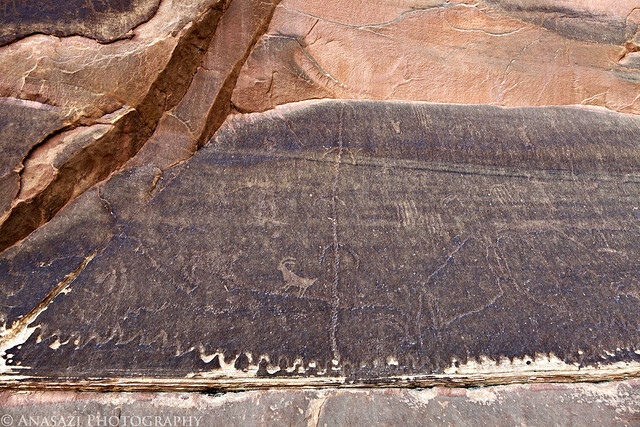 After a quick breakfast in Green River I made my way over to visit the Prickly Pear Flat pictograph panel. 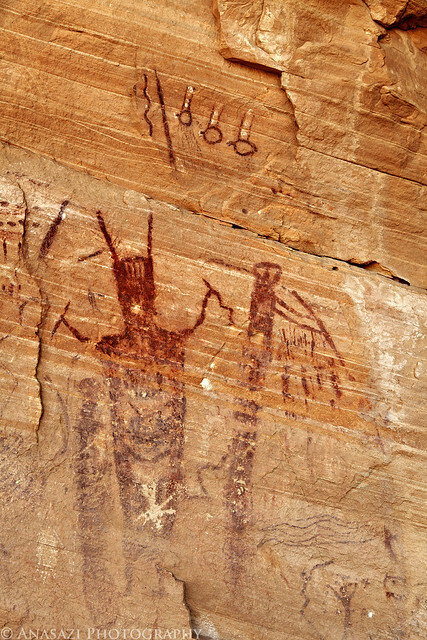 The Prickly Pear Flat panel contains a number of very interesting Barrier Canyon Style figures. Unfortunately, the rock surface they were painted on has not held up too well over the years. Here’s another portion of the large panel that might be depicting rain. Here’s a cool-looking flute player. There’s some of those flying circles at the top, too. 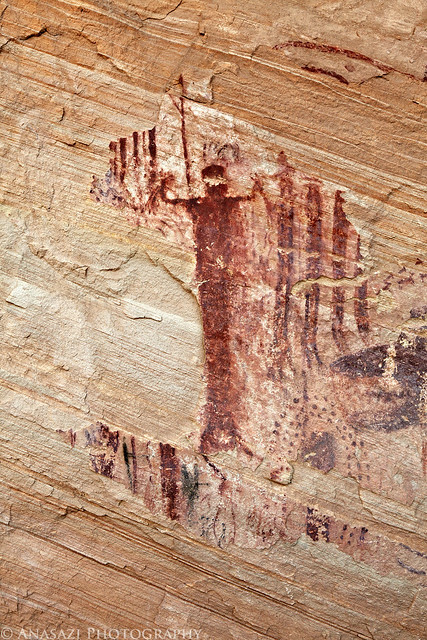 A closer look at another anthropomorph that appears to be holding some snakes…a common motif in the Barrier Canyon Style. 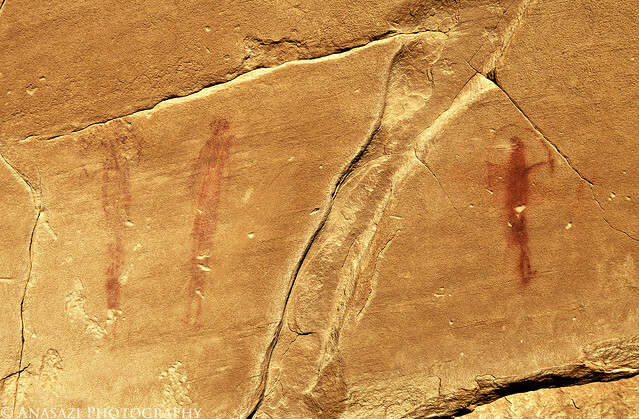 There’s a few footprints and dots carved into the sandstone ledge below the pictographs. Even though part of this panel has broken off, the main figure looks like it was painted to convey movement. 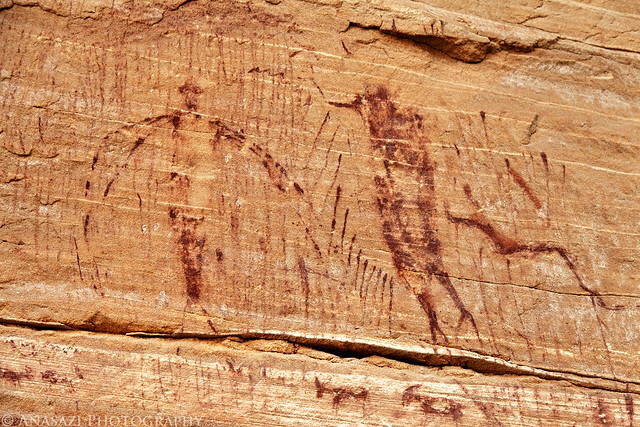 I really liked this line of stick figures found at the site. After hiking back to my Jeep from the Prickly Pear Flat Panel, I explored another nearby canyon and found a small Barrier Canyon Style panel. When I first arrived the panel was in direct sunlight and didn’t photograph well, but I liked this small panel so much that I hung around for another hour until it was all in the shade. 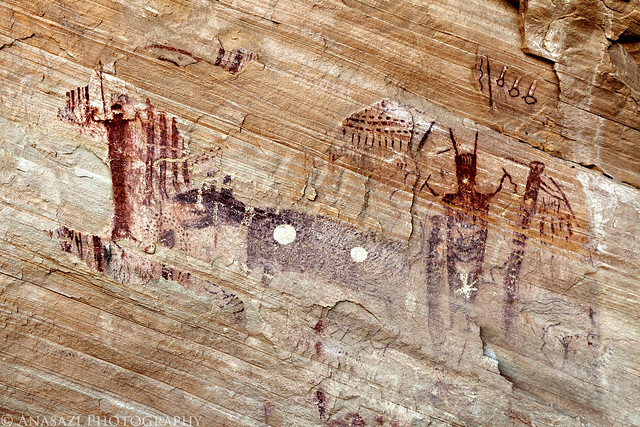 The figure on the left has it’s arms outstretched just like the main figure in the Ascending Sheep Panel. 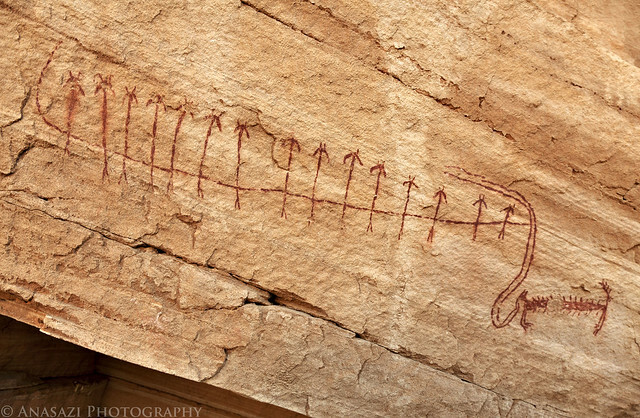 Looking closer, this figure might even have the same bighorn sheep head and snake tongue, too? The next figure on the right appears to be playing a flute and there seems to be a very skinny snake above them both. Here’s a wider view of the panel showing a few more of the figures painted here. To the left of the panel above is a large alcove that can only be accessed from this point. 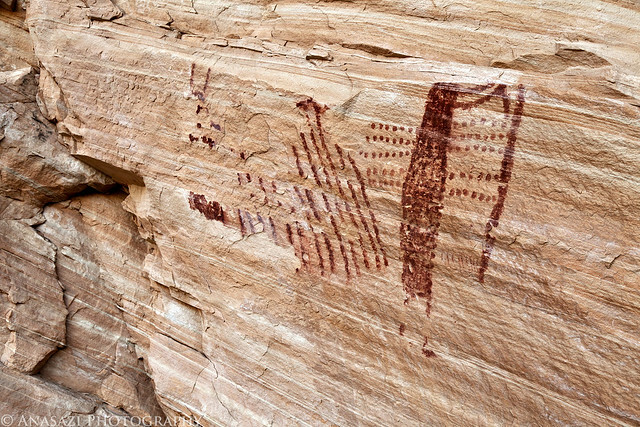 As you enter the alcove you pass these pictographs. 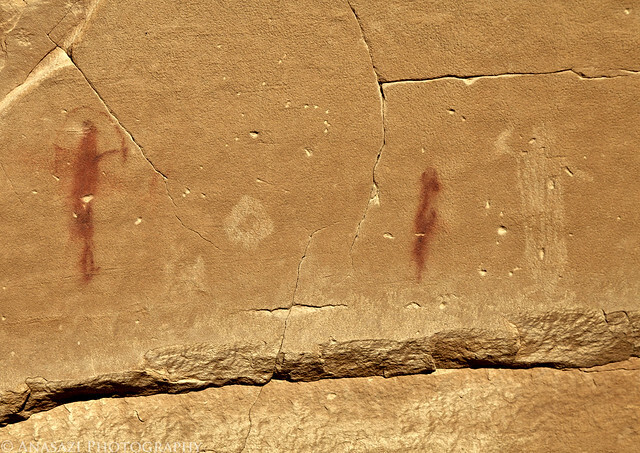 It’s hard to tell from the photo because of the angle, but the sandstone they are painted on has cracked and divided the figures in two. 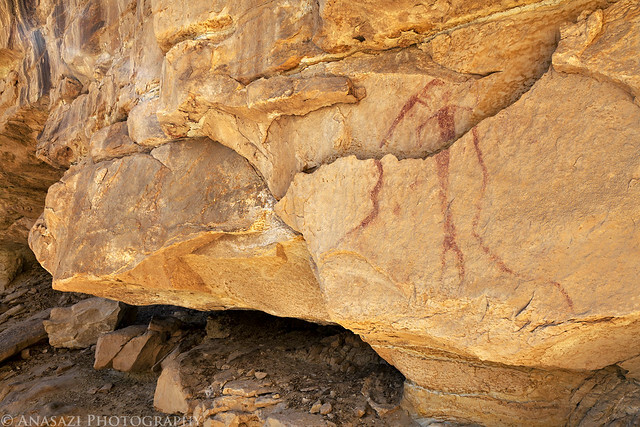 The next canyon I visited contained one very large panel of petroglyphs located in a very large alcove. These seem to be very old and were very hard to see, let alone photograph. I took a few photos here, but since they are hard to make out, I’ll just post this one. The vertical line in this panel reminds me of the Rochester Creek Panel. My last hike in the Swell for the day was down a nice canyon that cuts through the San Rafael Reef. 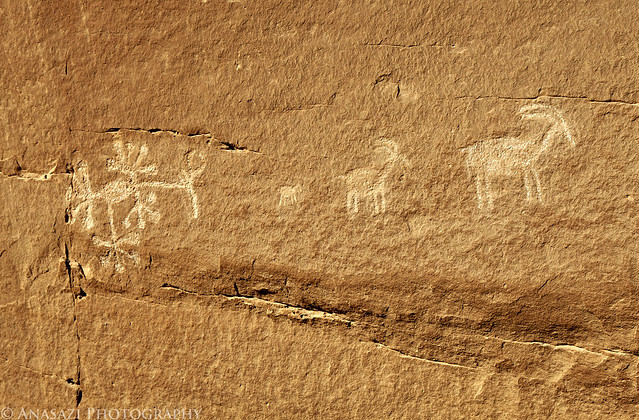 I hiked a few miles in and didn’t find anything at first, but did manage to find a few small petroglyphs and pictographs on my hike back to the Jeep. 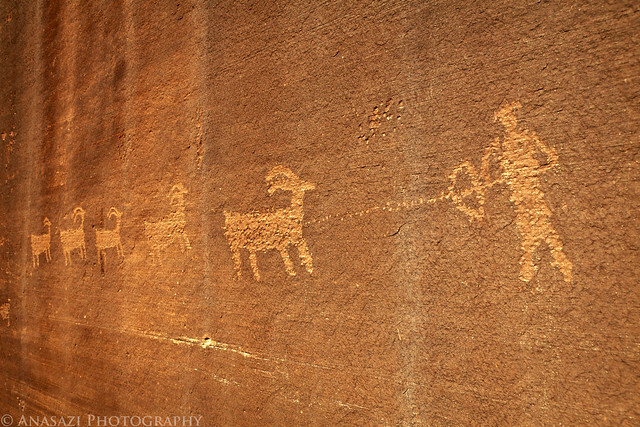 Of course there were plenty of bighorn sheep petroglyphs, but I have no clue what that thing on the left is? 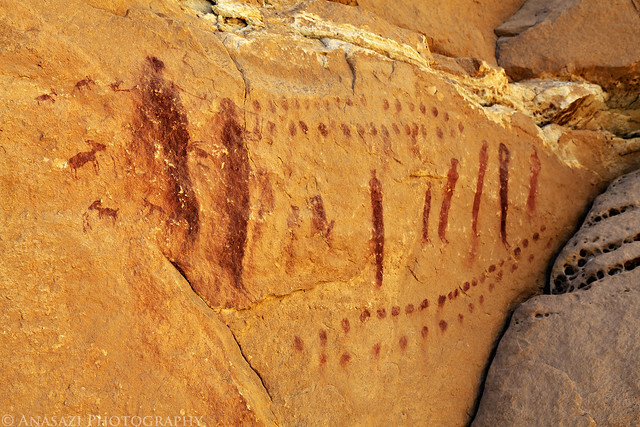 There were a few tiny pictographs nearby, too. They certainly look Barrier Canyon Style to me. 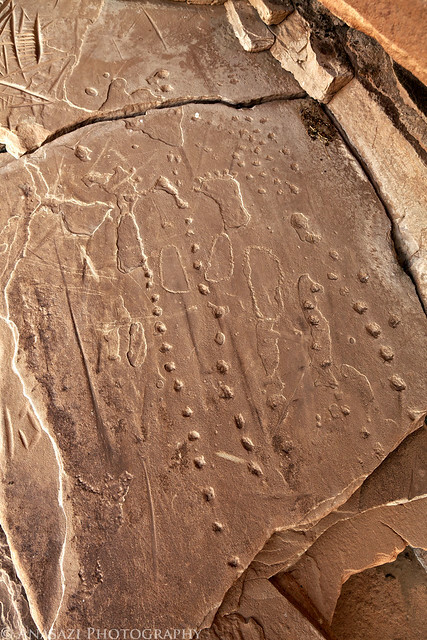 This was the last set of petroglyphs I found before reaching my Jeep again. A nice little hunting scene. After leaving the San Rafael Swell I made one quick stop in the Book Cliffs before heading home, but I’ll make that into a separate trip report.